70 MeV is a mass-energy quantum, and is the fundamental “brick” out of which all the material objects in the universe are built — including you. The humble electron is the elementary particle ground state, and its mass is “alpha-enhanced” by the fine structure constant alpha, which is the mass generator of the material universe. That is the “Power of Alpha”. Mathematically, the electron mass is 0.511 MeV, and 1/alpha is the pure number 137.036, so we have the equation m(electron)/alpha = 0.511 x 137.036 = 70.025 MeV. 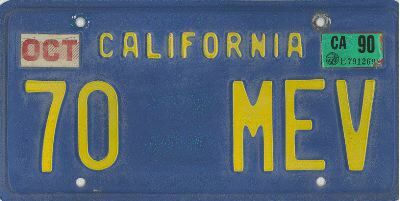 We can’t put that much accuracy on a license plate, but 70 MeV is pretty close to the right value. No one has objected yet to that approximation. That is just the beginning of the story, which takes us from the 0.511 MeV mass of the electron to the 172,500 MeV mass of the “top quark”, the heaviest-known elementary particle. It also gives us particle lifetimes that are spaced by factors of 137, ranging from the 15 minute lifetime of the neutron to the 0.0000000000000000000000001 second lifetime of the top quark. Come into the web site amd roam around. Physics often isn’t too complicated if we just look at things the right way. This 70 MeV web site was designed and constructed by Claudia Palazzi, and was dubbed “The Power of Alpha” by Paolo Palazzi, who also works in this field. It is populated by the writings and memorabilia of Malcolm Mac Gregor, who has been aided and abetted in these endeavors for more than half a century by his loyal spouse Eleanor Mac Gregor. We have here a web site constructed by Italians living in Geneva, Switzerland and filled with information by Californians living in Santa Cruz, USA, on the edge of the Pacific Rim. It is a tribute to the triumph of modern Internet and WWW technology, which we would modestly claim is due to the combined efforts of physicists worldwide over many centuries, as is the field of elementary particle physics.